Old is in quotes because it is not formally used in the name. But it is used locally to differentiate this part of the town. 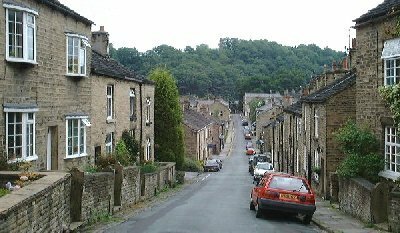 This is the largest part of the town and was developed in the 18th and 19thC with the coming of the mills and quarries. As a result most of the buildings are built of stone – hence another local term; the stone end of Bollington. Indeed, this is the only stone built village in Cheshire. The mills in ‘Old’ Bollington include Defiance Mill and the Bobbin Mill (Queen Street), Higher Mill and Lower Mill (both at the end of Church Street), Oak Bank Mill (now Hamson Drive), Clarence Mill (top of Clarence Road), Whitaker’s or Bannister’s Owlhurst Mill (Turner Street off Church Street), and the long lost Sowcar Mill in Sowcar meadow (off Ingersley Road). Other notable locations include St. John’s Church; the main shopping areas of High Street (pictured above) and Palmerston Street; Water Street, with its fantastic hanging baskets and window boxes in the summer, the old school building (Water Street Centre ), the river tunnel (really! ), these latter three streets forming the Historic Triangle; Pool Bank – more interesting in the past, when it was really a mill pool serving Defiance Mill, rather than the unattractive looking car park it is today; Beeston quarry with the old Oak Bank Mill chimney and the Lookout on top of its cliffs; Bridge End and its historic buildings (Bridgend Centre ); Queen Street, probably the oldest and most quaint street in the town; the war memorial gardens; Rock Bank House; Limefield House; Beeston Brow. The Macclesfield Canal aqueduct crosses Palmerston Street.The Recreation Ground is adjacent in the Gnathole. The Civic Hall stands on top of the Library, on the site of the old Big Sunday School. The very short Round Gardens passes behind the Dog & Partridge inn, with the police Bridewell in front of the old police station. Further down is the Town Hall opposite the now deconsecrated Methodist Church, with the Arts Centre behind it. St. Gregories church is the last building before the viaduct. The old railway viaduct across Wellington Road, now the course of the Middlewood Way, divides ‘Old’ Bollington from West Bollington.